Stamp Seal from Western Iran, Iron Age I-II, about 1350-800 BC Bronze, cast. 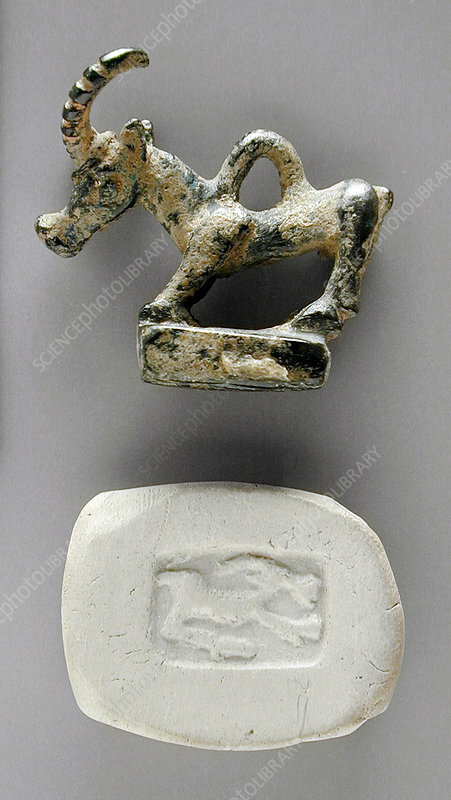 The stamp seal is a carved object, usually stone, first made in the 4th millennium BC, and probably earlier. They were used to impress their picture or inscription into soft, prepared clay. The device of the seal has seldom survived through time. It is usually only their impressions. The Bronze Age is a period characterized by the use of copper and its alloy bronze as the chief hard materials in the manufacture of some implements and weapons. Humans learned how to smelt, melt, cast, rivet, and to forge copper and bronze. The Iron Age is the period in cultural development succeeding the Bronze Age in Asia, Europe, and Africa, characterized by the introduction of iron metallurgy. The term Iron Age has low chronological value, because it didn't begin simultaneously across the entire world. Bronze preceded iron as a widely worked metal due to the fact that the metals which.